Within Sufism, which is the mystical branch of Islam, Zikr (Dhikr) is the “remembrance of God” which can be an activity practiced in the consciousness of the Divine Presence. These ritualized dhikr ceremonies can include chanting, music, meditation, trance and movement. The Mevlevi order (Turkish) includes counter-clockwise whirling within ritual position, in a neutral colored full skirt, with the arms held in ritual position and no accessories. The Tan oura, famous in Egypt, also depends on the whirling movement, if in a spiritual attitude he turns in a counter-clockwise direction; if he is turning for secular entertainment he may turn in either a clockwise or counter-clockwise direction. The Tanoura dancer wears a brightly colored full skirt, appliqued in the well-known Egyptian tent fabric design. The entertainer often adds accessory balancing and manipulation of frame drums, lowering the full skirt or taking off the skirt to spin in over the head, vertically, or in the fanous (lantern) position. The Zeffah is defined as a process ion with noise, the Zeffat al Arusah is the procession of the bride. The Zeffah movement is a simple walking procession to an iqa Zeffah (Zeffah rhythm) which informs the listener as to the purpose of this Zeffah. In the Zeffat al Arusah, ‘Awalim (professional female dancers) dance in an subdued, yet Orientale, manner in front of the bride. Often she/they will be wearing a Shamadan (candelabra) and playing the sagat (finger cymbals). 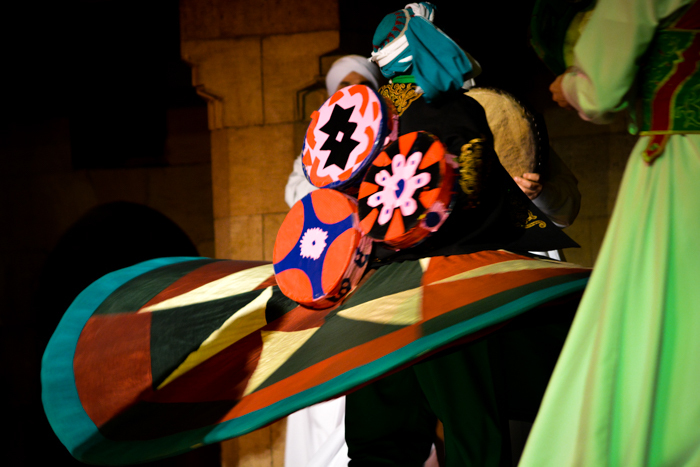 The Firqit al Zeffah (Zeffah group), new in the late 1980’s, can insert segments of “mini-entertainments” of folkloric dance and music, such as Sa’idi dance, Tanoura, and Suez canal dance, between ritual iqa zeffah. The “dance of joy” is danced on happy occasions, such as the Mothers of the bride and groom at a wedding or zeffah, to show their happiness for another’s happiness. The steps are happy, somewhat bouncy step-together-step, with no hip-work. The arms are up and informal, or it is possible to clap or hold hands in a circle.